Automate the manufacture of premium watches and jewelry to some degree in order to achieve maximum quality and precision. In terms of time and efficiency, this needs to make sense even for very small production runs. Mill watch cases and other parts on Robodrill machining centres. Robodrill’s inherent flexibility, easy setup and ease of use, makes it ideally suited to producing watch parts. Thanks to Robodrills ingenious tooling and clamping concept, automating even very small production runs makes sense. Once a workpiece has been set up, retooling times are very short. Anyone wearing the equivalent value of a robot on their wrist demands perfection. And even if premium watches are associated with handmade master craftsmanship: a small degree of automated production does make sense for quality reasons. In the spring of 2011, the LVMH Group acquired from the Italian Bulgari Family the majority interest in their empire. Jewellery and watches with the typical "Bvlgari" logo now adorn the French manufacturer's range of luxury goods. After Louis Vuitton, Moët and Hennessy, now Bulgari, established in 1884 by the Greek silversmith Voulgaris. The fact that of all places, Tokyo happens to be home to the largest Bulgari store, however, has absolutely nothing to do with those watches being manufactured on FANUC machines and with the help of FANUC robots. Bulgari watches are manufactured – where else? – in Switzerland. The headquarters in Neuchâtel are supported by several locations, whereby Bulgari Haute Horlogerie SA, which is the full name of this corporate unit, employs some 500 workers and a few older robots. If a new watch is designed in the "creative centre" in Neuchâtel, Andreas Schneider, responsible for production in La Chaux-de Fonds, receives the corresponding drawings and 3D-CAD data. Based on these data, he initially generates clamping devices and work piece holders. Then he plans the production step-by-step. This planning simultaneously lays the foundation for the CNC program of the Robodrill. Occasionally, e.g. at Baselworld, the world's largest and most important watch exhibition, Bulgari launches a special watch model in small lot sizes. Whereby the term "series" is relative, as the 2014 edition involved a mere 10 specimens for collectors – and their buyers had already been identified long before even the first collet had been created. The production routine, even for such scarce items, is identical to the models traded in large volumes. The cases of expensive collector watches are also milled on Robodrill machines. Andreas Schneider: "We are specialised in small series, and we even know how to produce them economically." The watch faces at Bulgari are configured in multiple layers and are so intricate that there is even an independent manufacturing operation for it, in addition to one for the watch straps. The case, dial and case-back are produced in La Chaux de Fonds. As soon as designs and drawings come from headquarters in Neuchâtel, the individual parts are sent back there for assembly. Ten pieces, along with the tiny collector's edition, is the size of a sample series. Regular series at Bulgari involve 20 to 1,000 watches. Schneider: "From 100 units, manufacturing of the case components is handled via the robot cells", says Andreas Schneider, explaining automation practice. The fact that automation is profitable even for small lot sizes is due to the ingenious tooling and clamping concept. Because once a workpiece is set up, the retooling times are very short. For recurring parts, the tools and clamps for which are in stock and ready for use, it doesn't even take two hours. Yet even for a new component, the initial tooling routine proceeds very quickly. There are items to consider such as: What kinds of tools to I need? Where do I clamp it, on the inside of the outside? Then the collets are milled on the basis of the CAD data. Prefabricated collets in standard diameters as semi-finished products in inventory can greatly reduce this step. Already in this phase, the FANUC Robodrill is a tremendous help, as the head of machining production emphasises: We do everything on the Robodrill. Entirely. Completely." Apparently it occurs so smoothly and quickly that he doesn't even formulate full sentences to describe it. The machining tools are then loaded into the Robodrill magazine with 21 tool positions and moved into the machine. Whereby standard tools are inserted according to the bill of materials and stored separately. Only special tools are assigned to the particular tool set of a work piece. Schneider: "But we also try to use the special tools multiple times. If we need a special milling tool, for example, the question is always asked: Are there components for which I could use this as well? Once the tools are in place and the collets have been prepared, the robot is set up in front of the Robodrill and the periphery of the robot is configured: Which pallet can be used as a work piece carrier? How many parts fit onto the pallet? If the order has been completed, the pallet, the work-piece specific collets and the gripper are placed on a rack and go into the tool storage area – which by the way comprises conventional rack storage, even though items of considerable value are stored there. This deserves mention due to the fact that for obvious reasons, the material storage area at Bulgari is a vault. The actual machining itself, even though it is a very valuable case component, involves a very conventional process – at least with respect to the machining. Depending upon the type of case, it is turned or milled, first using a basic dimension as a reference dimension or reference area. In terms of precision, the "Chef de Polisagge" specifies how many 1/100ths the precision needs to be, according to Schneider. 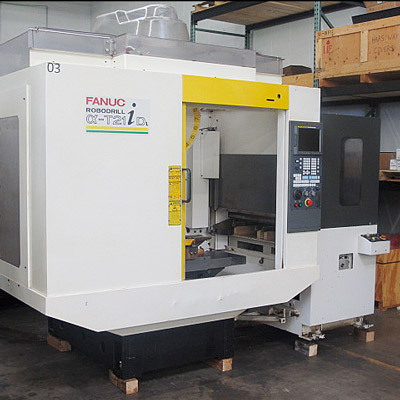 The machinery includes six FANUC Robodrills, all of which are designed as 5-axis machining centres, and equipment with a FANUC CNC 31i-Model A5. When it has to be precise, the FANUC machines are the order of the day. Other five-axis machines handle subordinated manufacturing tasks. 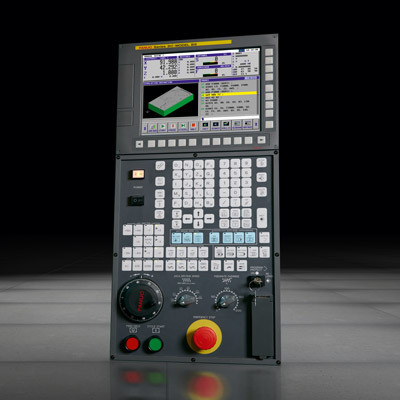 Even several years ago, the production experts at Bulgari upgraded an old Kitamura machine with a FANUC CNC of the previous generation with a CNC of the series 0-M for five-axis operations. Schneider's conclusion: "It works, but not very quickly." As a general rule, the machines can also be fed manually, if there is no program available, for instance, or if the robot comes to a standstill – which almost never happens. But the objective is not to reduce the cycle time by a few tenths of a second. "Quality and precision" are the priorities. "For such valuable workpieces, minimising the cycle time is not a serious argument", says Schneider, assured of the wisdom of his decision. Using the robot, he admits, would not yield any advantage, solely due to the fact that it would only have to wait until it retrieved the next part from the machine. For a series of 10,000 or 20,000 units, it would be a whole different story. As one can readily see from the plate of the Robodrill, the machining of watch components is not very easy. At any rate, there are many individual steps. Schneider: "We have many components with five-axis machining. And that's why I really appreciate how smoothly everything runs on the FANUC CNC 31i-A5." The robots comprise LR Mate 200iBs, that have already been service a few years now. The robot deployed on the Robodrill has lots of time on its hands. The machining cycles are of different lengths, but in fact they require roughly 90 seconds or longer. "The robot doesn't have to run like crazy", says Schneider and adds (laughing): "We sometimes crank it up when we have visitors." After the chipping process, the work piece is polished. Sometimes deburring is necessary. In doing so, Bulgari uses two different procedures. This primarily depends on whether the watch components are to have a shiny or satin finish. Only when the polisher has the part in his hand, can one see just how good the turning or milling process is. "It only happens on rare occasions, but if there are machining faults, we only see it after the polishing step. But then a major part of the value-added process is already been completed." Even the most diligent manufacturing process is not immune to material faults, however. And nonetheless: Gold or platinum as raw materials do not really allow one to manufacture two or three additional work pieces just to be on the safe side. This is a luxury that one can only afford during production startup. After all, delivery reliability is also a quality criterion.